3-room apartment 40 m2 on 5th floor, north facing position. Cosy furnishings: living/dining room with 1 pull-out bed (2 pers. 2 x 80 cm), TV (flat screen). 1 room with 1 french bed (140 cm). 1 room with 1 x 2 bunk beds (80 cm). Kitchenette (dishwasher, 4 ceramic glass hob hotplates, microwave, electric coffee machine, raclette grill). Bathroom, sep. WC. Balcony. Beautiful view of the valley. Please note: non-smokers only. 1 pet/ dog allowed. 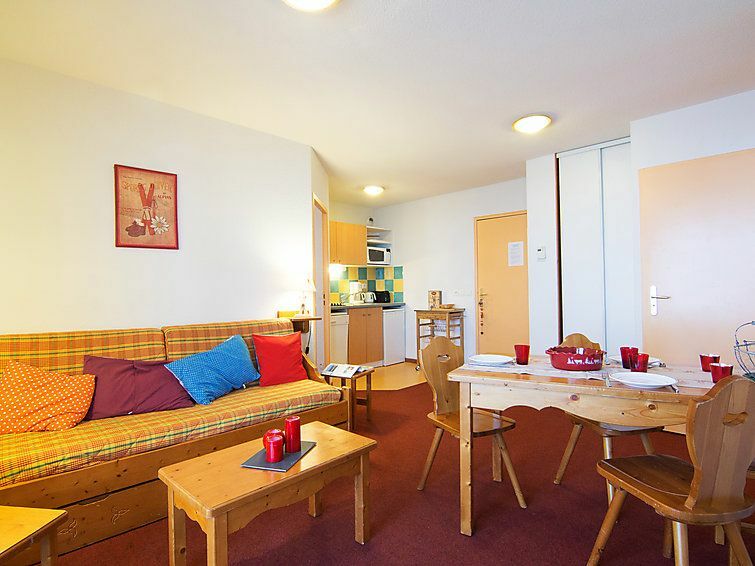 Apartment in building A.
Residence Les Pistes, 6 storeys, built in 2001. Above Corbier, 150 m from the centre, 150 m from the skiing area. For shared use: swimming pool heated (25 x 12 m, depth 90 - 200 cm, 01.01.-31.12. pool opening hours: 09:00-19:00). In the complex: lift, storage room for skis. In Winter: please take snow chains. Parking at 20 m on the premises. Shop, grocery, restaurant 150 m, bus stop 50 m, outdoor swimming pool 200 m. Ski lift, chair lift, slopes, ski rental 150 m, ski school 170 m, ski-kindergarten 300 m, sled run 150 m. Please note: In case of good snow conditions, the house is accessible on skis. The swimming pool facilities are 500 m from the residence at the municipal pool. Entrance for under 3’s is not allowed. Children between 3 and 5 years old are allowed subject to weather conditions (in winter). Entrance tickets to the swimming pool are included in your rental price and will be given to you when you check in.